The southern portion of the United States has proven to be a baseball hotbed, as the region regularly produces an abundance of exceptional baseball talent. This is no surprise, given the incredible amount of top-notch baseball facilities that exist in the South. Trying to narrow down this list to nine great facilities was more difficult than connecting with a Clayton Kershaw curveball. But after sifting through a multitude of superb complexes, we whittled our list down to nine facilities (listed in alphabetical order) that inspired us more than a Mike Trout moon shot. 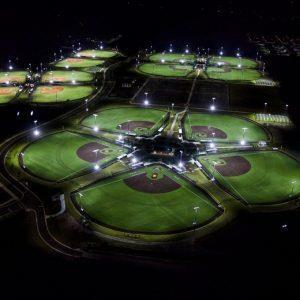 Boombah Sports Complex is innovatively designed when it comes to baseball facilities. The complex spans 100 acres, has 15 playing fields, three batting cages, bullpen space and state-of-the-art LED lighting. Nine of the fields consist of artificial turf, while the other six are natural grass. The fences vary in distance from 315 to 385 feet, making this venue perfect for tournaments geared toward just about any age group. The complex also has more than 900 parking spaces, a 1.2-mile recreational trail, three concession stands and a playground. 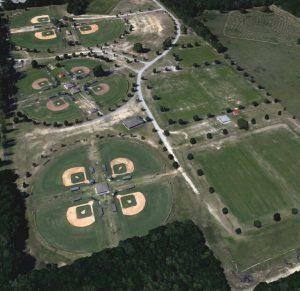 One of the premier baseball complexes in America, Champions Park of Newberry is a 16-field state-of- the-art complex with synthetic turf infields and natural grass outfields. Each field has scoreboards, oversized bullpen areas for each team and the entire complex is outfitted with standard Musco lighting. Attracting more than 30,000 visitors annually for games and tournaments, Champions Park was completed in June 2013. 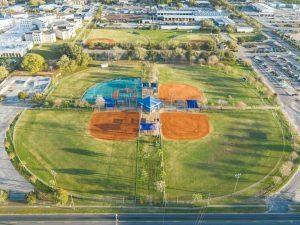 Located in North Central Florida, the complex can host youth baseball and fast-pitch softball with 220-foot permanent fencing on each field. 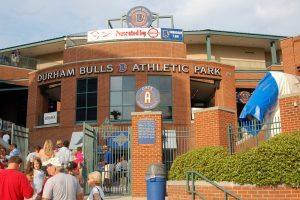 Originally named El Toro Park when it was built in 1926, Durham Athletic Park served as the home of the Durham Bulls minor league baseball team for almost 70 years. It became one of the most famous minor league ballparks in history thanks to the 1988 film Bull Durham, in which most of the filming was done at the park following the end of the Carolina League season of 1987. The film’s wide acclaim helped fuel public interest in minor league ball and the team. The park’s facilities are newly renovated and maintained as the home of the North Carolina Central University baseball team. 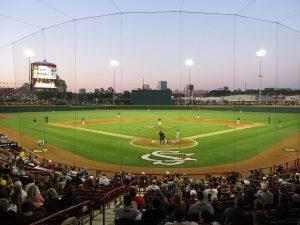 The home to the University of South Carolina baseball program, Founders Park is annually voted one of the best venues in college baseball. The 8,242-seat stadium was built for $35.6 million and opened in 2009. Founders Park allows visitors to enjoy a picnic terrace along left field, premium seating in the suite and club levels, and state-of-the-art video boards and sound systems. The stadium boasts fully equipped press boxes with TV-radio booths and is ADA-accessible. Players have access to a large weight room as well as four indoor batting tunnels. The field’s dimensions are 325 feet down the right and left field lines and 390 feet to dead center. This AAA baseball stadium located on the Elizabeth River in downtown Norfolk was once rated the best minor league stadium in the country by Baseball America. With a seating capacity of almost 12,000, Harbor Park is renowned for its outstanding view and sound design. Opened in 1993, the park features almost 9,000 lower-deck seats, 2,800 upper-deck seats and 400 seats in 24 luxury skyboxes. 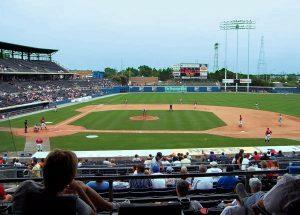 Harbor Park hosted the 1998 AAA All-Star Game and in 2007, the Major League Baseball Washington Nationals played an exhibition game against the Baltimore Orioles at the park. The James Messer Sports Complex is a baseball/softball facility that includes 11 lighted fields and a Miracle League (turf) field. The complex includes two officials towers with air conditioning. All fields have operational scoreboards that can be controlled from field level or the officials tower, new shade shelters and ample parking. The complex also features the state-of-the-art, 26,000-square-foot Mike Blankenship Skate Park. 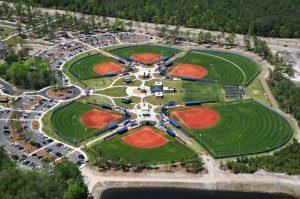 It has hosted numerous events, including the ASA Southern Nationals 18U; the U.S. Fast Pitch Association Sunshine State Classic; the ASA Girls Fast Pitch National Qualifier and the USSSA Youth Baseball Super NIT. The 80-acre facility includes 11 lighted baseball fields, one multi-use field and 13 batting cages (four indoor). Established in 1997 after a group of residents created a plan, formed a community alliance and approached the City of Ocala and Marion County with an idea to build a complex, it now hosts thousands of players each year. Each year, the sportsplex holds numerous tournaments, bringing in hundreds of thousands of dollars in economic impact to Marion County. 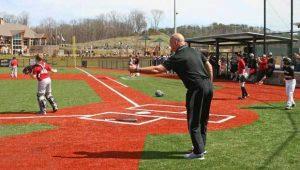 In 2010 and 2013, it hosted the 10U Cal Ripken World Series as well as the 2014 Babe Ruth League 14U World Series. 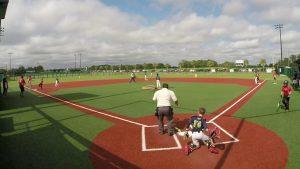 Each year, the Sportsplex plays host to district, state and regional baseball tournaments. The Ripken Experience offers a breathtaking backdrop of the Smoky Mountains and features six replicas of professional ballparks, each with unique dimensions and characteristics. The six youth turf fields contain lights, batting cages and bullpens on each field to give every player a true big league experience. Among the replica park players can compete on are Calfee Park, home of the Pulaski Yankees; Winston Salem Ballpark, home of the Winston Salem Dash; Fluor Field, home of the Greenville Drive; Engel Stadium, former home of the Chattanooga Lookouts; Isotopes Stadium, home of the Albuquerque Isotopes; and Camden Yards, home of Major League Baseball’s Baltimore Orioles. The complex enjoyed its inaugural season in 2016, when it welcomed more than 600 teams to the area. Tyger River Park, one of the South’s premier baseball and softball tournament complexes, features 12 youth baseball/softball fields arranged in convenient four-field clusters, a championship stadium seating 600 people and unmatched site amenities, clubhouse, concession areas, lounge, a VIP suite, wireless internet, covered seating, two playgrounds and flat-screen TVs at each pod. All fields are dirt and irrigated. Eight fields have permanent fences at 275 feet, two fields have permanent fences at 220 feet and two fields have permanent fences at 260 feet. The stadium field has a permanent 300-foot fence.